Initially, timing was used to estimate the amount of water for various washing machine cleaning cycles. 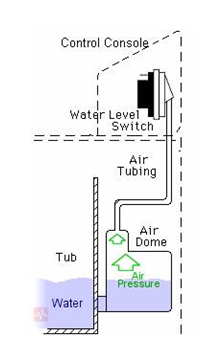 Today, many manufacturers sense the pressure developed in an air dome that is referenced to the water level and provides a much more accurate measurement. The air pressure level is measured either by a pressure switch or a pressure sensor with air providing isolation from the long term effects of operating a diaphragm in direct contact with water and other contamination. The pressure switch can close and/or open contacts to provide an input to other circuitry. In contrast, the pressure sensor can provide either an analog or digital output to the washing machine control unit. Since the pressure sensor’s output directly results in a power control function such activating a pump or motor, in some manufacturers products, the pressure sensor is mounted in a Power Control and Pressure Sensing Module. The water level in most washing machines is well below 2 feet (0.87 psi), so a pressure sensor that can measure 1 psi would work in this application.